Taking the devotees on yet another blissful sojourn in the divine premise of Brahmalok, Swami Abhedanandaji delved into the highly inspiring story of Sage Valmiki’s life. Swamiji then pondered upon the uniqueness of Valmiki Ramayana and the importance of following Dharma in one’s life. We bring to you some pointers from yesterday’s talk that will immediately elevate our thinking and living. 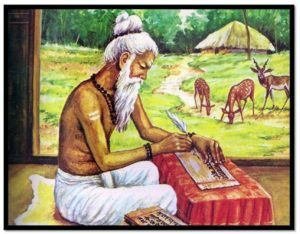 Before we unravel the invaluable teachings enshrined in the Valmiki Ramayana, let us contemplate on the story of the life of Sage Valmiki. It is said that there lived once a ruthless robber by the name of Ratnakar. He would rob and kill mercilessly for money and wealth. Once when Naradji was passing through the jungles, Ratnakar attacked and captured him. Naradji gave him whatever he had but asked him – Why was he committing such a sin of robbing people? Did he not know that his actions will ultimately bring sorrow to him? The words of a saint have immense power because his words come from austerity, bhakti (devotion), japa, puja and tapasya. Ratnakar had undoubtedly earned some ‘punya’ in his past lives which is why a saint like Naradji came into his life and he got to hear some words of wisdom. 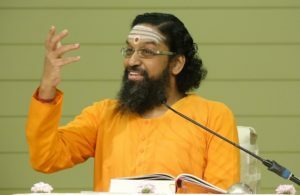 Ratnakar was puzzled by Naradji’s question and he said that he committed sin not just for himself but for his family – his wife, children, parents. When we commit any mistake, the first thing we do is justify our actions. The moment we give a cause to our mistake, the mistake becomes stronger. Naradji asked Ratnakar to go and check with his family if they will partake in his fruits accrued out of sin or if he will have to bear them all alone. All his family members refused to be part of the sins that he had committed. By the grace of God expressing through Naradji, Ratnakar thus realized that there is a relationship between action (karma) and fruit-of-action (karma phal) and that each person gets the fruits as per his own actions. Lives are not changed by merely reading books or by visiting holy places. Saints alone can transform lives. Ratnakar returned to Naradji, lamenting that nobody is willing to share his sins, he understood the consequence of his bad deeds and wanted to change himself. In life, one’s account of sins and good deeds is his alone; it is not something that can be shared with anyone. It was Naradji’s sankalp to transform the life of this robber, and thus he created a shift in the thinking of Ratnakar. Such is a glory of a saint and his pure sankalp! Naradji instructed Ratnakar to shift his conviction from ‘karma nishtha’ (abidance in actions) to ‘Ishwar nishtha’ (abidance in God’s will) by chanting ‘Ram naam’. Ratnakar wanted to follow Naradji’s advice but he was such a big sinner that even when he tried sincerely he was not able to take Lord’s name. Then Naradji asked him to chant ‘mara-mara-mara’ (means ‘killed’) as his japa mantra, which is basically repeating Lord’s name in reverse ‘rama-rama-rama’. Day and night Ratnakar, with single pointed attention on Bhagwan, repeated this mantra, and at last, emerged as a great saint. Tulsidasji says, ‘Ulta naam japat jag jaanaa, baalmiki bhaye Brahma samana’ – by taking the Lord’s name in reverse, Valmiki attained the highest. With single pointed focus, and a stable and firm mind, Ratnakar did austerity for a very long time. So much so that an ant hill grew around him and he came to be known as ‘Valmiki’ (the word ‘valmik’ means ‘ant hill’). Austerity means – Maintenance of the higher thought, for a long time, despite all difficulties and pain, so that the thought of object becomes the object of thought. The power of upasana (prayer) and the power of association with saints, is immense. It burnt all the sins of Ratnakar and transformed him into ‘Rishi Valmiki’. He became very quiet and developed great compassion and love in his heart. The Lord, who created the whole world has infinite power, He can do anything. He can burn all our sins too like he did for Ratnakar or transform a dullard into a great scholar like he did for Saint Kalidas and Panini. The core life principles enumerated in both the scriptures, Valmiki Ramayana & Tulsi Ramayana, are the same, but if we compare and draw contrast between the two, then we can say that – Valmiki Ramayana emphasizes more on the ‘Dharma’ aspect while Tulsi Ramayana emphasizes more on the ‘Sharnagati’ aspect (surrender towards the Lord). In Aranya Kand of Valmiki Ramayana, it is written, ‘Ramo Vigrahavan dharmah’, which means that Lord Ram is the very embodiment of dharma. In Tulsi Ramayana, Tulsidasji constantly makes sure that nobody perceives Bhagwan Ram as a mere human being. Valmikiji has also mentioned Bhagwan Ram as Lord’s avatar, but he portrayed in a manner such that the listener should consider Bhagwan Ram as a human being, which in turn can provide more inspiration to imbibe Ramji’s qualities. The thought that ‘Ramji was so great because he was God’, should not become too prominent and hamper one’s efforts to follow one’s dharma. One more unique point of Valmiki Ramayana is that it wonderfully brings out the beauty of Sitaji’s character. There is no other Ramayana which has elaborated so much on Sitaji’s dharmic character as Valmiki Ramayana does. In Valmiki Ramayana, it is written – When Hanumanji meets Mother Sita in Lanka, he requests her if he could carry her out of Lanka directly to Ramji, without Ravana even noticing. At that time Sitaji says, ‘Hanuman! no doubt you are like my son, but it is not right that I go with you like that. It is not my dharma and therefore even if I have to go through more pain, I will. I will only go when Ramji comes and takes me with honour and grace.’ So firm and resolute was Mother Sita in following her dharma! Many such incidents are described in Valmiki Ramayan. ‘Dharma’ has two definitions – ‘Dharyate iti Dharmah’ (that which holds is Dharma) & ‘Dhriyate iti Dharmah’ (that which we should hold is Dharma). That which holds all our goodness, our credibility, our love – that is dharma. Dharma is a very important aspect. A house is not held by money, it is held when everybody performs their due duties as per their dharma. In practicing dharma, one has to curb and control their tendencies and vasanas. And therefore performing one’s dharma is not easy. One who goes through pain to follow dharma, such a person is called a dharmic person. This was demonstrated by Bhagwan Ram; to follow the dharma of respecting his mother’s and father’s words, He was even ready to go to exile for many years. Dharma is a very subtle area and the foundation of dharma is in our ‘bhaav’ (attitude) i.e., what is our thought regarding a certain thing/person/action. Sometimes external actions appear very good, but intentions behind them may not be very good. If dharma is missing in anybody’s life, two things will happen – outer situations will become problematic and inner mind will be disturbed. The situations and people around us are nothing but the results of our dharma and adharma alone. It is the vritti of dharma that brings great qualities in a person such as being angerless and desireless, having self-control and purity of character, etc. The result of having such great qualities is that these qualities then help one face any difficult situation of life. Difficult situations appear small in front of a person who is dharmic; they fail to create even a ripple of disturbance in the person’s mind. Valmiki Ramayana beautifully propounds upon the values of dharma by picturing the character of Lord Ram. 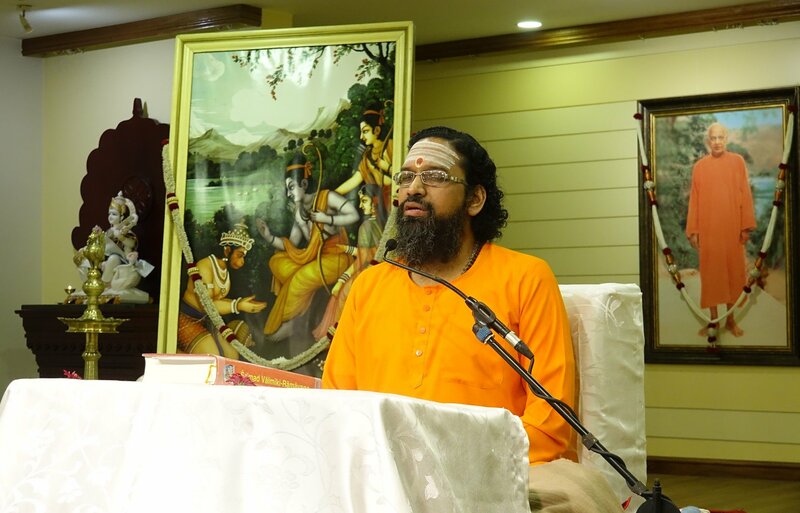 Swami Abhedanandaji elaborated on some of those values in great detail and their significance in our lives, during the second day of the ongoing Gyan Yagna. We share with you some of the memorable takeaways from Swamiji’s discourse which we all can apply in our daily life. What does Dharma bring in one’s life? In life, all situations arise only out of Dharma and Adharma. The quality of our mind itself is governed by our past actions. Joy in life does not come from money, qualifications, relationships or fame. It only comes through righteous living and extreme faith in the Lord. Dharma is the quality in a person which makes him worth living with, worth working with, worth interacting with, worth loving and serving. We don’t live with the physical body of a person; we live with his mind, his values and his attitude. If a person has integrity, chastity and purity and if he is trustworthy, then you can live with him happily even in a small cottage. But if you don’t trust someone and he/she lacks purity and integrity, then you can’t live peacefully with them even in a big palace. The actions of a person that lead to the possibility of him having a bright future, is the dharma of that person. On the other hand, such actions which reflect his future in a bad light, is the adharma of the person. The orientation of the intellect that helps us to focus on higher goals and gives us the strength to face the traumas of the world, is the dharma aspect, which is greatly emphasized in the character of Bhagwan Ram in Valmiki Ramayan. Qualities of equanimity, selflessness, courage, integrity etc. are assets of a person. Bhagwan Ram’s nature was adorable and respectable because of His countless dharmic qualities. Bhagwan Ram was a Karma Yogi and His life was full of selfless actions. World tests our selflessness, our serving and loving capacity at all times. The secret of Karma Yoga is to not think about our personal loss and again, then alone we can remain balanced. A person with higher thoughts and tendencies can take the onslaught of worldly problems with great ease. If a person identifies with lower thoughts then the situations of the world overpower him. Thoughts that manifest as a result of dharmic living, not only help us in attaining God but also help us in seeing the insignificance of the worldly problems. In Valmiki Ramayan, Valmikji asks Naradji, ‘Who is the one who holds all the Dharma, who speaks the truth, who is firm and resolute, who has gratefulness in his heart?’ Naradji then expounds on some 65 qualities of Bhagwan Ram in response to Valmikiji’s questions. Each of these qualities are very deep and difficult to imbibe. Niyatatma refers to the one whose mind is under his control. A person’s mind gets out of control if he has extreme jealousy, extreme aversion and extreme pride. Bhagwan Ram did not have any of these negative qualities, hence his mind was always under his control. He had no hatred for Manthra, He had no problem with Mother Kaikeyi, no jealousy with Bharatji, no competition with Lakshmanji. His mind was completely ego-less and unattached. In Bhagwan Ram’s life, there was no situation, whether he was being insulted or honored, when his speech or his emotions were uncontrolled. When Vishwamitraji told Ramji during Sitaji’s Swayamvar to get up and break the bow, Ramji got up with equanimity and walked comfortably, while all other Kings were walking with huff and puff. We fail to understand that we have only one mind and for anything we do (walk, talk, work, drive, read, write, sleep) we need that mind to be available, and if the mind is pre-occupied with something, we are as good as being absent in the present. And thus, if Niyatatma is not there, we become completely inefficient to perform any of our duties. This world constantly demands from us that we should serve. House, office, society, wherever we are placed, we are expected to serve. One who is Niyatatma alone can serve properly. In Bhagwan Ram’s life, He served His father, mother, brother, kingdom, everyone with complete selflessness because He was Niyatatma. Bhagwan Ram was ‘Maha-veerya’. He had all the power and strength of the cosmos. It is said that Bhagwan Ram killed the mighty Tadaka with just one shot of His arrow. He also effortlessly killed Khar and Dushan, who were fourteen-thousand brothers. Khar and Dushan had the boon that they will be killed only when they kill each other, so Bhagwan Ram gave His own form to all fourteen-thousand demons, and thus they got deluded and killed each other. ‘Dyuti-maan’ means one who has a glow on his face and in his personality. Glow comes in a person from his equanimity. Glow comes from the heart that wants to serve without any expectations. If one is desire-less, he is naturally content. For Bhagwan Ram, Tulsidasji says that He was not very happy or elated when He got the news of His coronation, and He was neither sad nor distressed when He was sent to exile. The glow of the face of Bhagwan Ram ever remained intact. Life will surely throw challenges at us, but the challenges become difficult to face when we don’t have a bigger goal in life. When one is living for someone higher such as Guru, God, Bhagwan, or dharma, then no situation can deter him. ‘Dhriti-maan’ refers to the one who is having ‘dhriti’ (fortitude/perseverance). Often times unexpected things happen in life and we get tired and exhausted trying to achieve our goals, at such times, the secret capacity in us which makes us feel that we should still keep moving ahead, that is called dhriti. The capacity to not give-up in spite of all obstacles is called dhriti. When Bhagwan Ram went to exile, He had to walk barefoot, eat only fruits and bulbs, and sleep on the bare ground for all 14 years. Tolerating pains for some higher goal and continuing to move ahead in spite of those pains, that is the dhriti of a person. To fulfill any higher goal and to attain any higher joy, the virtue of dhriti is a must. It is not possible that one leads a very comfortable and peaceful life at all times; even the life of Bhagwan Ram and Bhagwan Krishna was not easy. When one goes through his inner pain for attaining the higher goal through his dhriti, he emerges as a shining diamond. ‘Vashi’ means being in control. A person possessing this virtue has his convictions, emotions and actions in check; meaning his convictions are as per the scriptures, emotions as per the convictions, and expressions as per those emotions. Situations demand that we should have the ability to think right, take good decisions, speak wisely and work with efficiency and precision. It is expected that we give righteous and blissful attention at all times, but when we are carried away by our emotions of expectations, anger, sadness etc., we are unable to give the required attention. Not being able to rise to the demands of a situation is adharma. The system is such that if one does not give his best, he will not be happy. Fulfillment in life does not come by indulging in eating and drinking, instead it comes when we give our best. Being ‘Vashi’ is thus a very important virtue required by us. Swami Abhedanandaji concluded the talk series on ‘Importance of Dharma in Life’ with wonderful elucidation of the qualities of Bhagwan Ram which are indeed to be contemplated upon. We are pleased to share with you Swamiji’s concluding advice from the final day’s satsang. Life is never what we expect it to be. Everyone’s life is governed by uncertainties. Only if we knew what uncertainty was going to come, we could prepare for it better. Life is not faced by the external wealth or qualifications. It is faced by the strength of this steel like quality called ‘Dharma’. Dharma is the training through which you develop a mind that is not weak. It develops the attitude and mindset that is required to face the challenges. In Bhagwatam, this is illustrated perfectly through an example of a person who goes into a jungle (full of thorns) with his boots on. If he had gone barefoot he would have gotten pricked all over and would not have been able to cross the jungle. ‘Dharma’ is like the boots that can help us cross all situations in the jungle of life without getting pricked. Happiness is not based on external factors like possessing a good car or a big house. Happiness is based on our ability to follow our dharma and perform right actions. Sadness is a reflection that a person is not doing what he should do and unable to follow his dharma. Strength in life comes from abidance in one’s dharma, by doing the right actions despite all difficulties. A person feels sad or weak because he lacks certain kind of thoughts that inspire him to follow his dharma. What thoughts we should develop and hold on to, we will learn from the dharmic life of Bhagwan Ram. We continue to explore the jewels of dharma enshrined in the life of Lord Ram as propounded by sage Valmikiji in Valmiki Ramayan. In the context of dharma, ‘Buddhi-maan’ does not refer to the one who is intelligent. Rather it refers to the one who knows what is his ‘hit’ (ultimate good) and what is his ‘anhit’ (not ultimate good). At every moment of our life we have to choose between something lower and something higher. Buddhi-maan is the one who knows that picking renunciation, sacrifice and service over indulgence, enjoyment and ego, is what will take him towards the higher. It is important to realize that the ability to sacrifice for someone, to take pains for someone will lead to our ultimate good and wellbeing. Bhagwan Ram had an extremely sacrificial nature. He took a lot of pains for his parents, for Sitaji, Bharatji, Lakshmanji and for the people of Ayodhya. Our current education system is only based on teaching us how to earn money. It does not teach us the value of dharma, or how to sacrifice and serve, or how to have devotion in life. Ignorantly, we think we are very intelligent after going through such an education system, but the truth is that we lack the basic essence of being ‘buddhi-maan’. Life should be based on principles which are as per the scriptures. One who is ‘Neeti-maan’, he abides in the righteous policies in life. Policies such as – being respectful to parents, being regular in sadhana, serving and loving everyone etc. One should be firm in following the right principles and should be ready to even die for them. Bhagwan Ram depicted this quality through all His actions, thoughts and speech. ‘Vaagmi’ means eloquent – one who speaks beautifully. It is said that everyone in Ayodhya used to adore Bhagwan Ram because the He used to speak very beautifully. He used to speak aptly as per the time, place and opportunity, and with lot of humility and softness. Sometimes we don’t speak correctly as we are not in a proper frame of mind. Speech is a reflection of our thoughts. Vaagmi means one whose thoughts are controlled and sweet. ‘Shree-maan’ means the one who has Lakshmi (glow) on his face. Whatever thoughts are in one’s mind, they show on his face. Happiness, sadness, anger, shame, greed, dullness – all these emotions instantly come on one’s face. And if someone has devotion, dispassion, brilliance, that also comes on his face. One should not have a pale hanging face; instead the face should be blossoming with higher and beautiful thoughts in the mind. Bhagwan Ram had broad shoulders and long powerful arms. Long arms are the sign of a great person and they also indicate that He is ready to take the devotees out of the quagmire of this samsaar (world). Bhagwan Ram had a beautiful conch (kambu) like neck (greewah). He had a beautiful stout chin (maha hanuhu). He had good collar bones (goodh-jatru) and a rounded chest (peen vakshaha). He had a broad beautiful forehead (sulalaatah), and had a very good complexion with big eyes (vishaalakshah). Dharmagya refers to the one who knows his dharma. If we fail to know our dharma in any situation, we are bound to make mistakes. One who follows his dharma, his future will always be secured. If we are not convinced that, ‘not following one’s dharma will lead to unpleasant situations’, we will not be able to sacrifice for dharma. 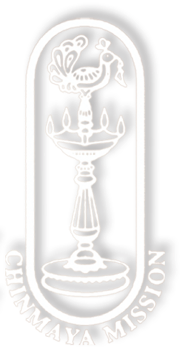 Satya-sandh refers to the one who maintains his vows towards truth. Vow is that which opposes or curbs our baser natural instincts. A person is known by, how much lower instincts he can control and that controlling power doesn’t come unless he takes some vows in life. We need vows to curb our vasanas and to hold on to bigger higher emotions. If vows are not there, we cannot even adhere to our most basic responsibilities. Marriage, Brahmacharya, Sannyaas – are examples of vows that one takes in his life. Bhagwan Ram was such a Satya-sandh that even though He was invited to the kingdom by Sugreev and others, He did not go because He had taken the vow of being in the forest for fourteen years. Smaller vows give you the strength to take bigger vows in life. Saints are bigger because their vows are bigger. Conquering the mind is difficult without vows. Discipline in life to achieve the higher, cannot be imposed from outside, it has to be invoked from inside. A person with vows alone can be committed, credible and can achieve bigger things in life.